After the end of the semester, I wanted to read something that did not require a lot of thinking. I really didn’t think that The Imaginary by A. F. Harrold would have substance. I thought this would be fluff. I was wrong. Rudger is Amanda’s best friend. He doesn’t exist, but nobody’s perfect. Rudger is imaginary. Yup, that’s pretty much what I am going write for the description of the book. This was so beautifully written that I lack the vocabulary to describe it. I won’t do it justice. The story was breathtaking beautiful. I think that anyone would like it, not just middle graders. It’s a profound story about friendship. I was enchanted by the lore of where imaginary friends come from and where they go when you don’t need them anymore. I cannot confirm or deny but there might have been some hysterical crying on my part. 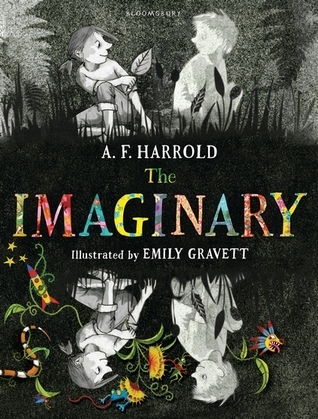 This entry was posted in Fantasy, Middle Grade and tagged A. F. Harrold, Emily Gravett, Illustrated by Emily Gravett, Imaginary Friends, middle grade, The Imaginary. Bookmark the permalink.